All About MoistureMaster ™ Advertisement However, off line testing is typically more incon- sistent because the sample size is so much smaller (typically about 10 grams). Q. I have a recent Novatec wheel dryer. Can you integrate the MoistureMaster™ controller into the dryer itself? 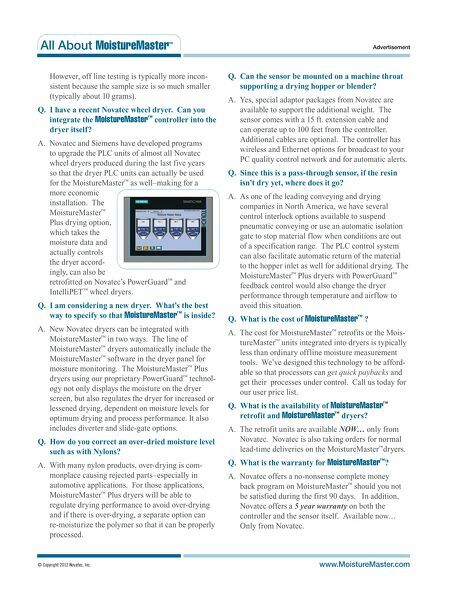 A. Novatec and Siemens have developed programs to upgrade the PLC units of almost all Novatec wheel dryers produced during the last five years so that the dryer PLC units can actually be used for the MoistureMaster™ as well–making for a more economic installation. The MoistureMaster™ Plus drying option, which takes the moisture data and actually controls the dryer accord- ingly, can also be retrofitted on Novatec's PowerGuard™ IntelliPET™ wheel dryers. Q. I am considering a new dryer. What's the best way to specify so that MoistureMaster™ is inside? A. New Novatec dryers can be integrated with MoistureMaster™ MoistureMaster™ MoistureMaster™ in two ways. The line of dryers automatically include the software in the dryer panel for moisture monitoring. The MoistureMaster™ dryers using our proprietary PowerGuard™ Plus technol- ogy not only displays the moisture on the dryer screen, but also regulates the dryer for increased or lessened drying, dependent on moisture levels for optimum drying and process performance. It also includes diverter and slide-gate options. Q. How do you correct an over-dried moisture level such as with Nylons? A. With many nylon products, over-drying is com- monplace causing rejected parts–especially in automotive applications. For those applications, MoistureMaster™ Plus dryers will be able to regulate drying performance to avoid over-drying and if there is over-drying, a separate option can re-moisturize the polymer so that it can be properly processed. © Copyright 2012 Novatec, Inc. Q. 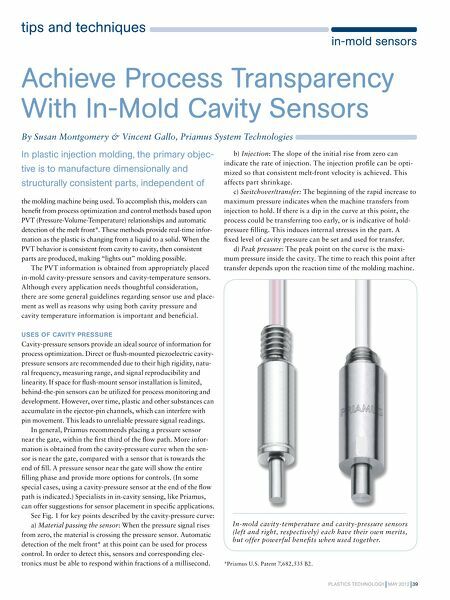 Can the sensor be mounted on a machine throat supporting a drying hopper or blender? A. Yes, special adaptor packages from Novatec are available to support the additional weight. The sensor comes with a 15 ft. extension cable and can operate up to 100 feet from the controller. Additional cables are optional. The controller has wireless and Ethernet options for broadcast to your PC quality control network and for automatic alerts. Q. Since this is a pass-through sensor, if the resin isn't dry yet, where does it go? and A. As one of the leading conveying and drying companies in North America, we have several control interlock options available to suspend pneumatic conveying or use an automatic isolation gate to stop material flow when conditions are out of a specification range. The PLC control system can also facilitate automatic return of the material to the hopper inlet as well for additional drying. The MoistureMaster™ Plus dryers with PowerGuard™ feedback control would also change the dryer performance through temperature and airflow to avoid this situation. Q. What is the cost of MoistureMaster™ ? A. The cost for MoistureMaster™ tureMaster™ retrofits or the Mois- units integrated into dryers is typically less than ordinary offline moisture measurement tools. We've designed this technology to be afford- able so that processors can get quick paybacks and get their processes under control. Call us today for our user price list. Q. What is the availability of MoistureMaster™ retrofit and MoistureMaster™ dryers? A. The retrofit units are available NOW… only from Novatec. Novatec is also taking orders for normal lead-time deliveries on the MoistureMaster™ Q. What is the warranty for MoistureMaster™? A. Novatec offers a no-nonsense complete money back program on MoistureMaster™ be satisfied during the first 90 days. should you not In addition, Novatec offers a 5 year warranty on both the controller and the sensor itself. Available now… Only from Novatec. www.MoistureMaster.com dryers.